USA Today has an AP report today that a ship under contract to the U.S. Navy fired shots at a small Egyptian boat. The article explains why the small boats would approach a ship going through the canal. The full article is here. Small boats selling cigarettes and other products often swarm civilian ships moving through the canal. These waterborne merchants know not to approach military vessels but the Global Patriot looked like a civilian vessel, said the security official, speaking on customary condition of anonymity. Egyptian peddler’s are among the most persistent in the world. Many Americans are caught off guard, and even frightened, by the persistence of these men (and children). Americans are accustomed to going into a store, picking up what they want, and saying “How much?” It isn’t that way in many parts of the world, especially in Egypt. You may say, “I don’t need that,” or “I don’t want that.” “Leave me alone.” The response you get is like that of a three-year old, “Why you don’t need that?” And the persistence continues until you are safely inside the security of the tour bus and driving away. Even then the salesman may hold on to the side of the bus as it leaves his area. 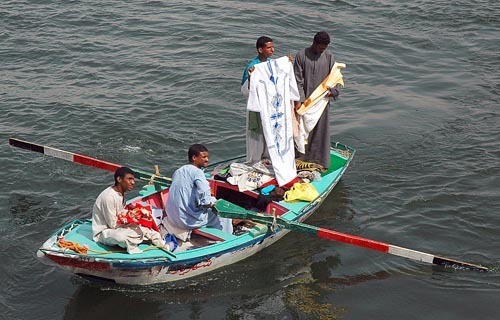 The photo below was made at Edfu during a Nile Cruise. I think these men are Nubians, but I have several other photos of Egyptians doing the same thing. This entry was posted in Culture, Travel and tagged Egypt, Suez Canal. Bookmark the permalink.